Jaipur : The political manipulation is being done by political parties, among the political upheaval over the Lok Sabha elections, on the other hand, many politicians is doing change their party to get the ticket from party and contest the election. While, many leaders have changed the party recently, now a big political gossips caught the attention of media. A big political news of state is coming in the media, which says that a big leader of Congress might be join the BJP soon. 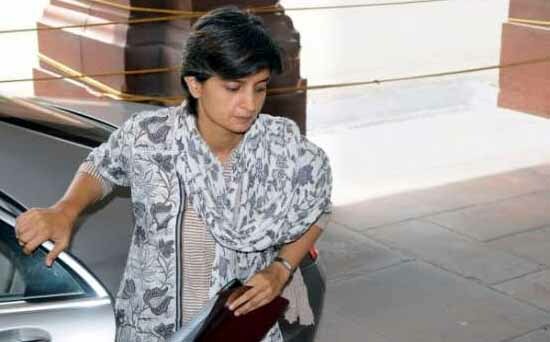 According the report, Congress MP Jyoti Mirdha has recently met the BJP's Union Minister and state election in-charge Prakash Javdekar. In such a situation, speculation about Jyothi Mirdha's joining the BJP has caught the thrust. Moreover, it is believed that she might contest election from Nagaur Lok Sabha seat. In such a situation, if Jyoti joins BJP and contest election from Nagaur then it may be a shocking name in BJP. Notably, Jyoti Mirdha has been received hug support of people in Nagaur Parliamentary Constituency and people still remembers her grandfather Nathuram Mirdha as the Gandhi of Marwar, who has been elected MP six times. When Jyoti Mirdha contested Lok Sabha elections from Nagaur in the 2009, Congress President Sonia Gandhi came to campaign for her and overwhelmed to see the crowd in support of Jyoti Mirdha. Significantly, Jyoti Mirdha got the MBBS degree from SMS Medical College of and she is a doctor from the profession. In the year of 2009, first time she contested election for 15th Lok Sabha and became a Member of Parliament by winning the election.